Purple Line Extension Section 2 Tunnel Boring Machines Art and Naming Contest announcement! The Purple Line Extension Transit Project is adding two more tunnel boring machines (TBMs) to its TBM family! The new additions will join Elsie and Soyeon, the TBMs digging Section 1 of the Purple Line Extension. The Section 2 TBMs will be responsible for the second leg of the tunneling journey, digging from Century City to Beverly Hills. 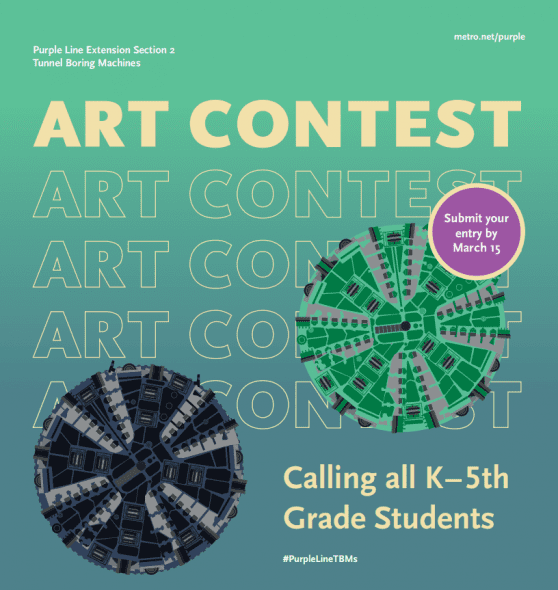 Metro is inviting Los Angeles County students from kindergarten through 12th grade to participate in an art and naming contest for the TBMs. Students from Kindergarten through 5th grade will compete to illustrate their ideal community that includes the Purple Line Extension. 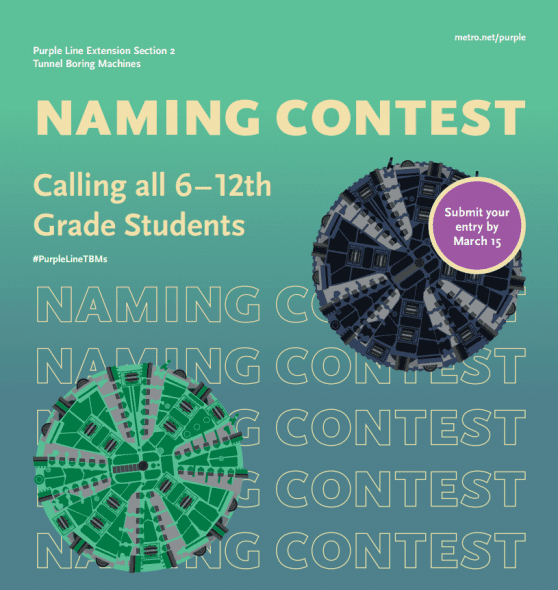 Students from 6th through 12th grade will compete to choose two names, one for each of the TBMs. To participate in the art contest, students need only submit their drawings. For the naming contest, students must submit a 200-word essay or a two-minute video. Submissions for the TBM Art and Naming contest will be accepted from January 14 through March 15, 2019. A selection committee of elected officials and community influencers will make their top selections. Once the committee weighs in, L.A. County residents will be invited to cast their vote in support of the art and naming contest winners. The winning TBM artwork and names will be displayed on the side of the huge TBM machines during the unveiling ceremony, which is anticipated to happen Summer 2019. At that time Metro will recognize the students and award prizes to the winners. The winners will also receive a special commemorative Metro TAP card with the winning names and art work and additional prizes. Naming of the TBMs is a mining tradition that dates back to early times. Since the 14th Century, Saint Barbara has been the patron of miners, protecting them when they are working underground. This homage to saints evolved into the commemorative naming of tunneling machines with female names before the digging begins. Visit metro.net/purple for detailed contest rules and submission information. The Purple Line Extension will extend the subway from its current terminus at Wilshire/Western for nine miles to Westwood. The project is being constructed in three sections. The second section will add 2.56 miles of new rail from Beverly Hills to Century City and feature two new stations. Follow the Purple Line Extension on Twitter and Facebook. Follow the Purple Line Extension TBMs journey into the Earth on Twitter @PurpleLineTBMs. Any plans to stream metro meetings live or make the meetings available online? Why couldn’t they gave gave coordinated with section one contractors and used the same TBMs as them. Seems wasteful to use 2 new ones. Hey Steve, sorry that doesn’t really answer Miguel’s question. I understand that the 3 section approach may have been practical from a federal funding approach, but that doesn’t really explain why there is a need for a new set of TBMs for each section. Why couldn’t the TBMs be re-cycled and reused? Did Metro look into that possibility and find it wasn’t feasible? If so, I’d like to understand why. I’ll take another stab at it. There are two other issues at play: TBMS are designed for particular soil conditions — making it hard to recyle or re-use them in different areas. And, as I alluded to in earlier answer: the three sections that were originally going to be built years apart — due to funding and politics — are now being built almost simultaneously (not exactly as section 1 opens 2023, 2 in 2025 and 3 in 2027 if the schedule holds — but there will be overlap). Tunneling is underway on section 1 and and is scheduled to start on section 2 later this year. So we’ll have TBMs working at the same time on the project on different sections. That’s a faster way of doing it than with just two machines. This is why simply contracting for two TBMS and using them for the entire project is not, we think, the best solution. Hope that explains it better. Thanks Steve, appreciate the detail. And understand the point on timing. I would just like to get clarity on your point on TBMs and soil conditions–was your statement a general one or did Metro look at Sections 1, 2 and 3 and affirmatively determine that different TBMs were required? Also, Section 3’s tunneling will start after Section 1’s tunneling is complete so the timing consideration goes out the window, leaving only the soil consideration (or something else that hasn’t been mentioned). Obviously TBMs are very expensive, so I want to confirm that Metro actually looked into potentially re-using them and isn’t wasting $50-$100 million (approximate cost for 2 TBMs from what I can tell). And finally, what happens to the old TBMs? Does Metro store them and see if they will work on other projects (e.g. West Santa Ana branch, thus making it eligible for acceleration per Metro’s policy)? There could be overlap on the section 2 and 3 tunneling. The TBMS belong to the contractors or are leased by them. Metro doesn’t own them. The shortish answer to your over-riding question is that political and funding considerations dictated the project would be built in three sections and the decision was made to treat each section as its own project and, thus, go with the different contractors for tunneling. To repeat, that is what is driving all of this — please remember that under 2008’s Measure R the original plan was to open the subway sections in 2019, 2026 and 2036 respectively and each of those segments would be about the same length (that changed when Wilshire/La Cienega was shifted to the first section). That approach was decided upon to prevent too much funding from going to the Westside in the early years of Measure R. Again, politics were involved. This approach also may have helped secure federal funding for each section as it allowed Metro to ask for big chunks of change (over a billion dollars per section) not all at once. Federal funding – no surprise here – involves a lot of politics at the Congressional level. As it happens, TBMS also must be geared toward particular soil conditions so this approach is likely helpful to that. But to be clear, the decision to build the project in stages was not made because of soil conditions or TBM costs. The decision was made in 2008 with Measure R. The environmental study for this project would not even be complete until 2012. Might the entire project, including the tunneling, been less expensive if one contractor was building the entire thing all at once and sooner rather than later? Perhaps, but we can’t know for sure — and building it all at once may have meant work starting later rather than sooner because of political considerations, etc. Metro took Measure R to voters with the project broken into three phases and that’s what voters approved. And that’s how we’re going forward with the obvious caveat that the passage of Measure M in 2016 provided the funding to compress the timeline to something I think will be better for the region. They should be named after Beverly Hills officials, just to irk them. Just Read The Instructions & Of Course I Still Love You. Wilma and Betty, who know a thing or two about Bedrock.